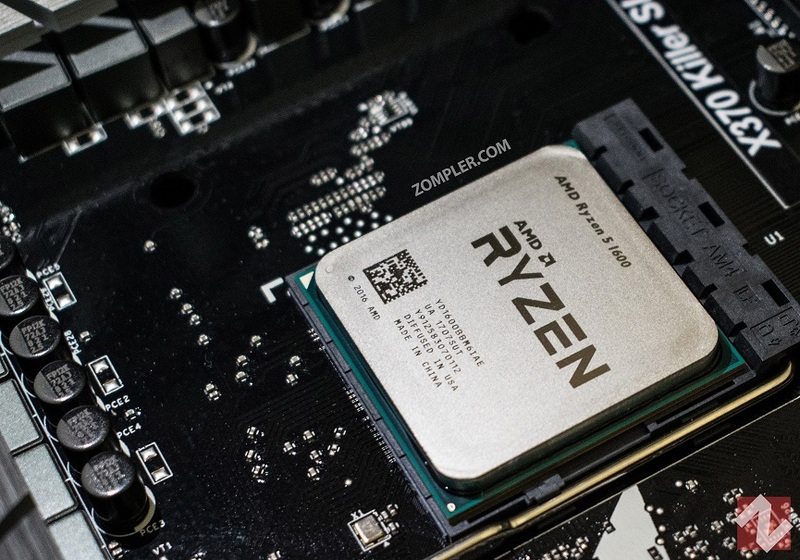 With AMD's new AM4 platform and Zen architecture, the Processor market has really changed its direction in last few months, Ryzen processors have emerged as one the the best value for money processors for All-round performance. Earlier code-named "Summit ridge", but I like Ryzen better. 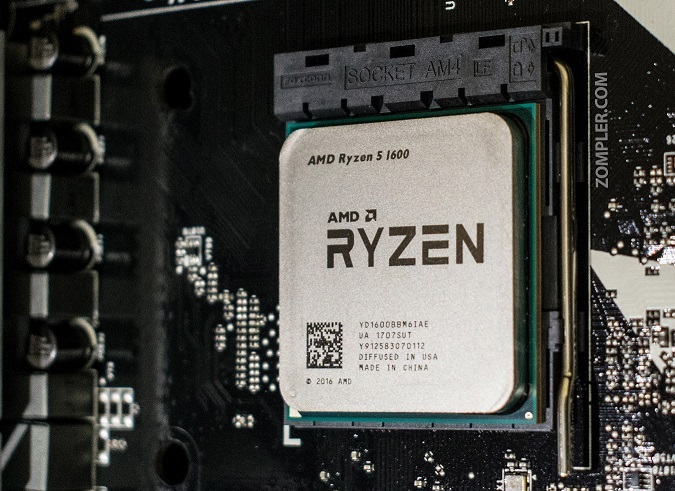 Now the best value for money among the Ryzen lineup is unanimously the Ryzen 5 1600, which is exactly the one we have on hand today and I am going to Review it purely for processing and workload, We are also going to Overclock Ryzen 5 1600 on Air cooler and see where it takes us and what are the benefits. 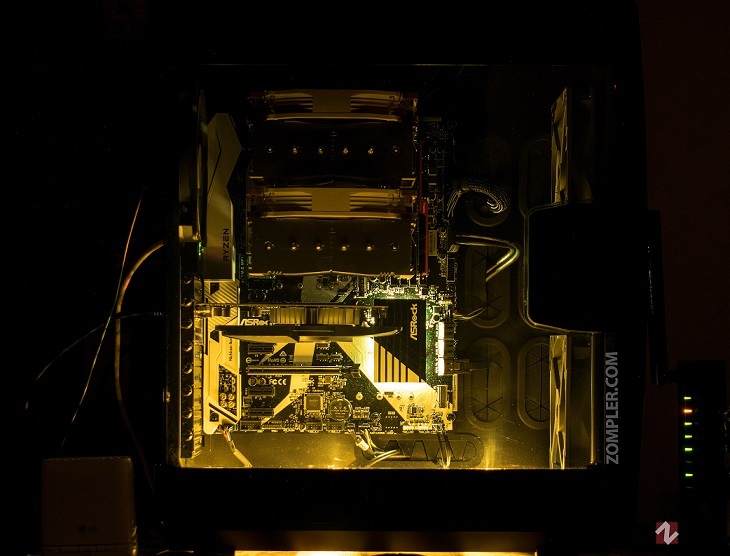 There have been many overclocking reviews all over the Internet for Ryzen processors but I feel like they miss the one thing many ask, How well can you overclock them on Aftermarket Air coolers ? Since most of them are usually done on open benches, or stock chassis, using stock wraith cooler, Liquid coolers etc. We are going to overclock Ryzen 5 1600 on Noctua NH-D15 which is one of the best Air coolers, and in a chassis made for airflow, which is Corsair Air 740(admittedly an ugly chassis). So as you can see the setup here is very much abundant on Air flow and we shouldn't be thermally throttled in anyway. Benchmarks used : Cinebench R15, AIDA64 Extreme suite - CPU Queen, FPU mandel, PhotoWorxx. These benchmarks are used to solely test the Processor only, not the use the GPU in anyway. Before we get to overclocking this CPU, lets's get the stock clock benchmarks out of the way, then we will get back to them later for comparison to overclocked benchmarks. Ryzen Stock clocks are set auto at 3.2GHz and turbos to higher clock on lower cores like only 1 or 2 cores, on Ryzen 5 1600 only one core turbos to 3.6GHz. Auto voltage ranges from 1.1-1.2V on stock. Temperatures on our setup and Prime95 100% load for 30 minutes are 51C/47C for tctl/tdie and VRM respectively. 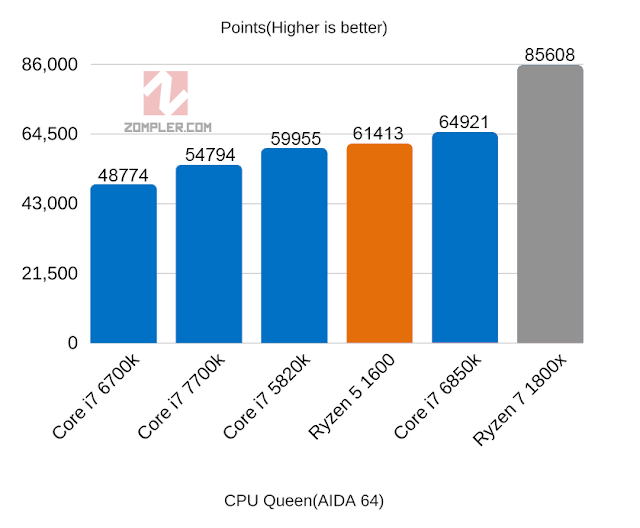 AIDA64 benchmarks are mostly Processing features benchmarks and should give a fairly accurate idea of what to expect from a CPU when comparing scores. Now that stock benchmarks are done, let's proceed to overclocking and see where that gets us. It says air but we are actually using one of the best coolers to overclock our Ryzen 5 1600, which is the NH-D15 from Noctua, which is still an air cooler but it's very big and many of smaller chassis may not support such a cooler. To start with this, I went straight for 4Ghz on 1.4V Vcore settings, and it did boot up, but it did not manage its way through 5 minutes of Prime95 and Cinebench, so that is unstable. Now I went and upped to Vcore to 1.41875V and then I upped it even more to 1.4375V, it was unstable even then, now this actually means my CPU cannot do 4Ghz on any voltage that is healthy for CPU long term, so it was time to bring it down. Next I tried 3.9Ghz and 1.4V Vcore, which was stable, so we are getting somewhere, and now we know the clock limit on this, time to bring down to voltages to healthy level now, remember, more voltages = more heat. Then I tried 3.875GHz which is close to 3.9Ghz and that took about 1.375V to get stable. 1.375V is the highest AMD recommends to go, and that is what I was aiming for, but I don't want to run it at 1.375V all the time, so I am going to go lower and find the lowest voltage here, at which I can get benefits of overclocking my R5 1600, because sincerely above 1.35V just to get the extra 100Hz is in the territory of diminishing returns. So I tried 3.85GHz at 1.35V which was stable, and then I tried 3.8Ghz which was stable at 1.325V, which is a big jump at the lowest of clock sacrifice, and that is what I decided on for my daily use to keep heat generation at its lowest rate and get the most out of the Ryzen 5 1600 using overclocking. If I need some of that extra juice for CPU intensive tasks again, I can clock my CPU higher for a shorter time to use it, but for daily use I feel that 3.8GHz is the best on all cores. I am also experimenting with P-State OC on my motherboard settings which is ASRock X370 killer SLi/ac, which I will be reviewing really soon, so stay tuned for that. I also had the time to run Benchmarks on all stable clocks I managed to get on this CPU, so let's have them here and you can see for yourself what were the results. All the Ryzen 5 1600 OC benchmarks are recorded at 3.8Ghz(On air cooling) unless otherwise specified. 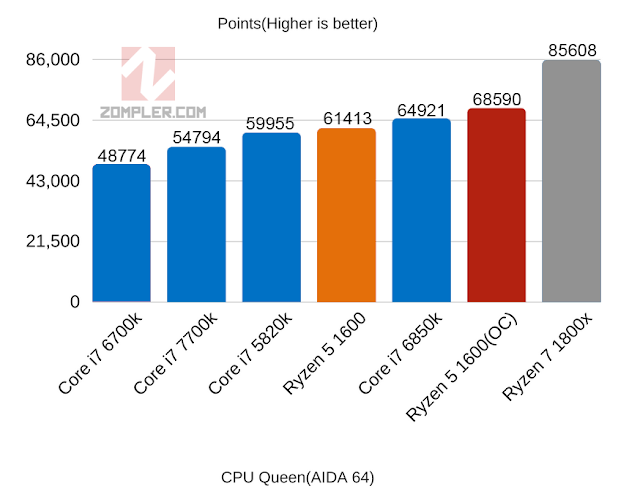 Apart from these AIDA64 CPU suite Benchmarks, another significant CPU Benchmark is Cinebench R15 which is used to gauge a CPUs Rendering capabilities. 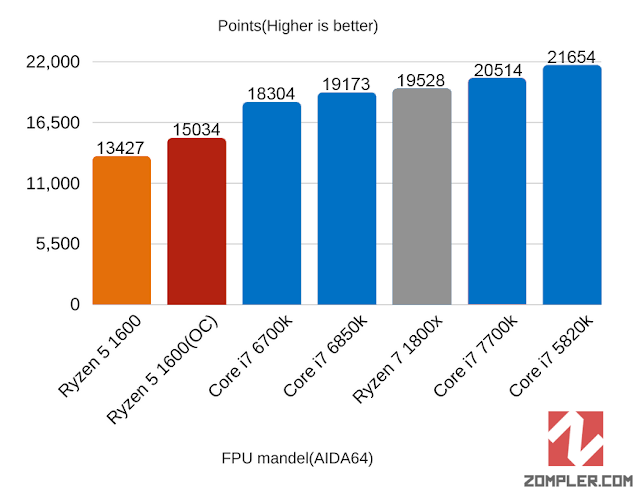 So I used it to Benchmark Ryzen 5 1600 on stock and on OC and here are the results on different clock speeds. 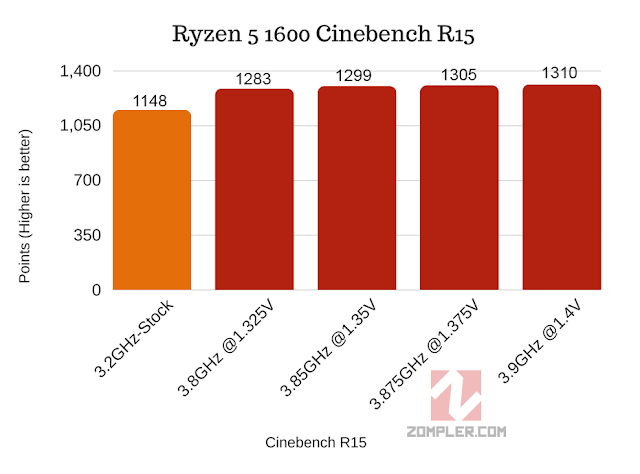 There isn't that much gain in raw compute performance going from 3.8GHz to 3.9GHz, as can be confirmed with the cinbench R15 scores in the above chart. As I mentioned earlier my CPU was unable to reach 4Ghz under any Vcore voltage values and the maximum I reached was 3.9Ghz on 1.4V which is not really thermally suitable and will degrade the chip in long term. 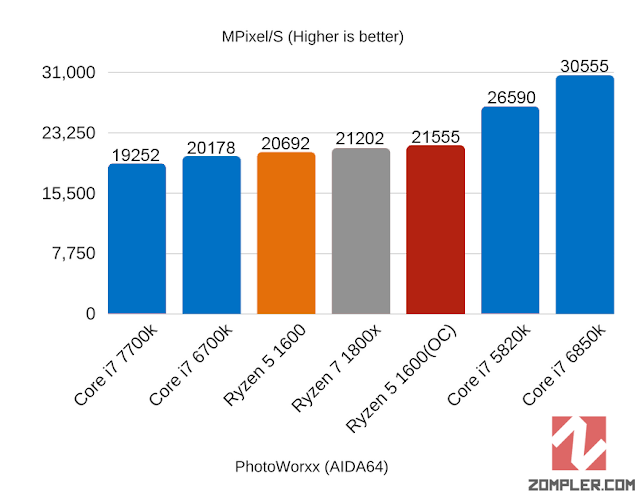 As we can see in above chart, there is obviously a very good payoff in overclocking your Ryzen 5 Processor, but getting that extra 50-100Hz for some extra juice out of your CPU isn't really worth it above a certain frequency and voltage. So I used 3.8GHz @ 1.325V Vcore for my daily use and it isn't any much more hotter than the stock clocks. So you should definitely overclock your CPU if you want the maximum out of it, but reaching for that extra 3.9-4.0GHz isn't really worth it if most of your workload is productivity based, you won't notice any difference in 3.8GHz over 4.0GHz. And as we can see Ryzen is not thermally challenged in the case of overclocking but it hits a voltage wall, sure there might be some better binned chips out there capable of better frequencies at lower voltages, but it all comes down to what you have got. As long as you get a decent aftermarket CPU cooler, you should be able to overclock your Ryzen CPU on fairly comfortable temperatures and you should overclock your Ryzen processor.